Marina Del Rey corporate housing is surrounded by boats. It’s not an invasion though. It’s just that the dominant feature of “The Marina” as it is known locally is boats. Marina Del Rey is in fact the world’s largest man-made small craft harbor. There are a total of eight basins having a capacity of well over 5,000 boats. Further, not of the boats that call this place home port are here at the same time. This is fortunate, because there are approximately 7,000 of them, and that’s more than would fit. Marina Del Rey is not a big city, with a population of less than 10,000. Seriously, there are almost more boats living here than people! Work in the week, sail on the weekend. California dreaming, indeed. Only from your Marina Del Rey corporate housing. Marina Del Rey Corporate Housing: What’s in a Name? How excited would you be if instead of Marina Del Rey corporate housing you were being asked to live Ballona Creek corporate housing? Doesn’t quite have the same ring does it? The patch of land where the Marina now sits has had a bit of an identity crisis over the years. The very first place-name given by Anglos was Ballona Creek. That’s what the duck hunters who frequented the wetland then called it. Then it become Port Ballona, but a big storm pretty much wrecked that project, so the next set of developers tried to escape that legacy with a new name, “Del Rey”, later gussied up to “Playa Del Rey.” After WWII, Eisenhower contributed Federal money to make the marina development possible (I like Ike, and so should you) and “Marina”, logically enough, replaced “Playa”. So this is the story of how you come to stay Marina Del Rey corporate housing. This time the name is going to stick! 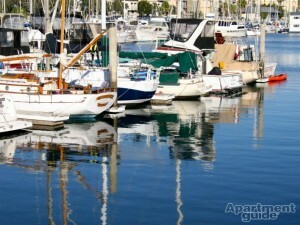 You can browse all of our Marina Del Rey Corporate Housing here. This entry was posted in Corporate Housing and tagged Corporate Housing, Corporate Housing Leader, Marina Del Rey on December 7, 2016 by Lee McDonald.